This week I am going to feature the Labradoodle and one of my very own dog pals! Do you remember Bella the Bulldog? Well, Sophie is her little sis! 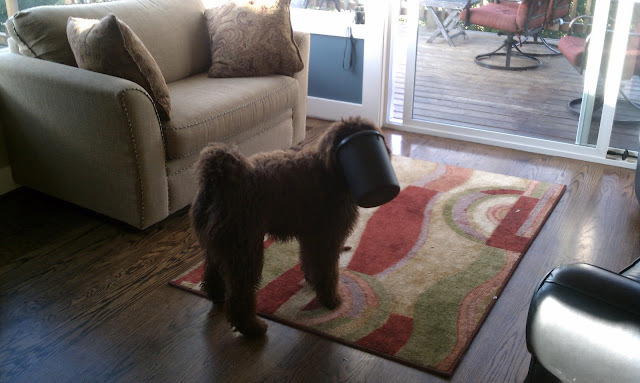 Sophie is a 6 month old, chocolate Labradoodle who was one of my first dog pals. She is so sweet! She loves to play and run! Here are some fun facts about Sophie that her owners shared! She loves to rip pieces of paper up into the tiniest pieces and then spread them all over the house! She loves her sister bulldog, Bella and loves to run circles around her while barking like a crazy girl. She LOVES to give hugs and snuggle her nose into her Mom's belly. She is a very good girl and graduated with honors from her service dog academy class! She loves to push the pedal on the trash can, empty all the contents all over the house after she rips them up into tiny itty bitty pieces, then she takes the inner plastic liner out of the metal can and this is the result! Very easy to train, Labradoodles are social and enjoy the company of people and other dogs. They're comfortable with either city or country life, as long as they have your good company. Labradoodles are devoted, playful, obedient, kid-friendly and clever like both Labrador Retrievers and Poodles. A Labradoodle is a mixed-breed dog, the product of breeding a Labrador Retriever and a Poodle. 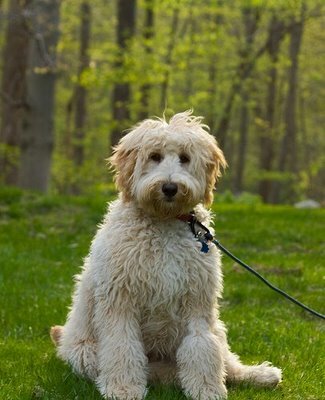 Labradoodles were originally bred in Australia, and like the Goldendoodle, are a perfect solution for challenged folks needing a companion that wouldn't agitate their allergies. The Labradoodle's low shedding coat has made them a family favorite since their appearance in the early 1990's. Labradoodles have three size categories, depending on the size of their Poodle parent. As you'd guess, a Standard Labradoodle is a medium/large dog that is parented by a Standard poodle, the largest of the poodle breed. 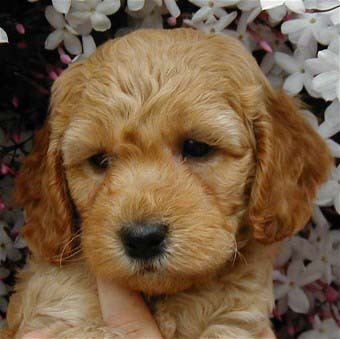 Miniature Labradoodles have a Miniature or Toy Poodle parent. Medium Labradoodles fall between these two sizes. Notice how the height of the male and female are the same but the weight is higher for the males. You will find Labradoodles in a wider range of colors than Goldendoodles: white, cream, tan, coffee, brown, red, grey, or black. Labradoodle's coats are either the fleecy Retriever-shag (though a bit shorter), or a soft wooly Poodle-curl. Their coat is typically full and soft and grows to 3"-4", though backcross Labradoodles usually have a 4"-7" coat. Moderate exercise is sufficient for a Labradoodle, like a daily fetch game with a long walk. Grooming is a rare task. A longer-haired Labradoodle will need a good brushing once or twice a week, but a shorter-haired or clipped Labradoodle will only need brushing twice a month. I love Labradoodles and I hope you enjoy them as much as I do! Very nice write up. You described labradoodles perfectly.